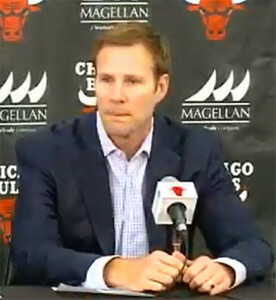 Fred Hoibert at Bulls news conference. Former Iowa State coach Fred Hoiberg returned to Ames to tie up some loose ends and say goodbye to his players. After five years on the Cyclone bench Hoiberg was named the new coach of the Chicago Bulls this week. Hoiberg says he has visited with athletic director Jamie Pollard about the future of the program but did not endorse a potential successor. He says he is fully confident that Pollard will make a great hire with the help of President Stephen Leath. Cyclone assistant T.J. Otzelberger is expected to be interviewed. Hoiberg says he did not bring Otzelberger back from Washington with the idea of him taking over. Hoiberg says those rumors are “absolutely not the case.” He says he brought him back because of the great amount of respect he has for Otzelberger and the job he did before.